Applications for 2019 Volunteer Sessions are now available online! We plan to notify all applicants of our decision by May 15, 2019. If you forget to include a postage paid envelope (per the instructions), your application is immediately denied. We would highly suggest that the actual applicant complete the paperwork and NOT the parent. Parents typically do not take the time to read and often do not follow the instructions. So, when the application is submitted without the envelope and the application is denied, it gets sort of dicey. DOWNLOAD AND CLICK HERE FOR THE APPLICATION -- AND DON'T FORGET THE ENVELOPE! 1. You must be able to attend the mandatory training on the Thursday prior to the first session of Safety Town at Lewis Rec Center. 2. You must be able to download the application, fill it out completely, do as it says, and mail it in with a self addressed, return, stamped envelope. This is the only way to apply to be a volunteer. If you do not follow the steps or forget the self addressed, stamped envelope - you are automatically rejected. If you do not sign the agreement, you are rejected. 3. You must be able to attend all of the days in the session you apply for. 4. You must be able to put your cell phones down and focus on the campers during the sessions. Cell phone usage will not be tolerated during sessions. 6. You can volunteer for more than one session - you just need to be able to attend all of the days in your session. 7. If you have volunteered in the past - that doesn't automatically guaranty that you will be accepted this year. 8. If you have been removed from volunteering in the past, please do not apply again. 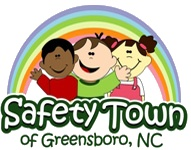 Safety Town is two-hour a day, two-week program for five (5) and six (6) year old children that teaches safety lessons on strangers, traffic, pedestrians, fire, bicycles, bus, poisons (including drugs), water and guns.